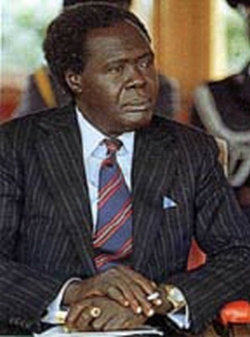 Milton Apollo Obote was the first Prime Minister of Uganda from the time of its independence in 1962 until 1966 when he became President of the Republic of Uganda. In 1967 Obote gave a speech on language and nation building at a conference on national unity held at Makerere University. That speech appears below. The task of opening Seminars insofar as I am concerned very often gets me in trouble. When I received your letter to open the Seminar, I had to take a quick decision and I had to consider carefully whether to come here and discuss with you in the Opening Address what I consider to be important in respect to the issue. I came to the conclusion that I should not at the Opening Address say too much that might create an artificial atmosphere in the Seminar. I agreed to come to open this Seminar not only because of my association with one of the organisations cosponsoring it but also because of my interest in the subject matter of the Conference. I have a personal interest in the subject matter and at the same time in an official capacity I have a very big interest in what you will be discussing here for the next four days. I want to say briefly that Uganda finds difficulties in identifying herself, and that Uganda has a serious language problem. Our present policy as a Government is to teach more and more English in schools. We are not unmindful of disadvantages inherent in this policy. We know that English, before Independence, was the language of the administrator. It was the language of the people who were rulers and by which Uganda was ruled. We know that many of our people learned English in order to serve in the Administration, at least to serve our former masters. It would appear that we are doing exactly the same; our policy to teach more English could in the long run just develop more power in the hands of those who speak English, and better economic status for those who know English. We say this because we do not see any possibility of our being able to get English known by half the population of Uganda within the next fifteen years. English, therefore, remains the national language in Uganda when at the same time it is a language that the minority of our people can use for political purposes to improve their own political positions. Some of our people can use it in order to improve their economic status. In spite of this reasoning, we find no alternative to English in Uganda’s present position. We have, therefore, adopted English as our national language—in fact it is the political language No Member of Parliament, for instance, is unable to speak English and indeed it is a qualification for membership to Parliament Those in the Seminar will understand the challenge facing us. The Uganda National Assembly should be a place where Uganda problems are discussed by those best able to discuss them, and in our situation it would appear that those best able to discuss our problems are those who speak English. This is a reasoning which cannot be defended anywhere; there is no alternative at the present moment. We do also see that those amongst us in Uganda who speak English and have obtained important positions because of the power of the English language, are liable to be regarded by a section of our society as perpetrators of colonialism and imperialism; or at least as potential imperialists. This, fortunately, has not yet become a public issue in Uganda. Nevertheless there is a real possibility that as long as English is maintained as the official language, spoken by a minority, a charge against its use could be made on the ground that it is the language of the privileged group. But the Government and the people of Uganda do realise that there are certain advantages in our learning English. We could not, for instance, adopt Lugbara—one of our Northern languages as our national language. It is clear that the task of teaching Lugbara itself would be beyond our capacity and ability and since language has an economic power in that whoever in a country of this kind knows the official language is likely to get higher and higher in the Government service, the task of teaching Lugbara or adopting it could result in serious riots and instability. I suggest that the same applies practically to every other language in Uganda. It is probably safe to say that Luganda and Lunyoro, are spoken by the greatest number of our people but immediately we adopt either of them as the official language for administrative purposes or legislation, some of us will have to go out of the Government. I, for instance, would not be able to speak in Parliament in Luganda, neither could I do so in Lunyoro, and I think more than half the present National Assembly members would have to quit. The areas we now represent would not like to have just any person who speaks Luganda to represent them. They would feel unrepresented. So, there again, we find no alternative to English. Then comes culture. The problem of culture is slightly different from the political problem and this is essentially a problem of how best we can maintain and develop the various cultural forms in Uganda through a common language. I have no answer to this. I am well aware that English cannot be the media to express Dingidingi songs. I have my doubts whether Lwo language can express in all its fineness Lusoga songs, and yet I consider that Uganda’s policy to teach more and more English should be matched with the teaching of some other African language. Currently we are thinking of what this African language should be. Already, of course, in Primary schools children learn in their own mother tongues but then it means that we have to find Primary School teachers and post them to each tribal area. This does not allow for the movement of teachers which may be a great disadvantage to the teachers themselves. The practical effect is that, having been to a Teacher Training College, teachers have no other place to go to except the tribal district. I consider this as something an Independent Uganda should not encourage. There can be no doubt that time will come when some of these languages will lose meaning. We may today think that a tribe will lose very much if it loses, its tribal language. I do not think so. Not at least two thousand years from now. I find it, therefore, easy to suggest that the teaching of an African language in Uganda schools today is difficult because of the lack of teachers. Someone may suggest that there are some two million people who speak Luganda and ask: “Why not recruit some fifty thousand to teach Luganda throughout Uganda”? I think the problem posed by languages like Runyoro/Rutoro and Luganda in the context of Uganda’s geographical position is a different problem from that posed, for instance, by Swahili. The teaching of Runyoro/Rutoro or Luganda will assist Uganda in the years to come in that people of Uganda will be able to communicate with one another in one common language. But it will not assist Uganda in communicating with her neighbours. It would be difficult for those across the Sudanese border to be interested in learning Luganda or Runyoro/Rutoro when their contact with Uganda is really contact with East Africa. It would be difficult for the Congolese who already, by the way, speak some kind of Swahili to bother to learn our new national language when they know that across the borders of Uganda there are millions of people who speak a language they already know—which is Swahili. So the adoption of any of our present languages in Uganda may just go to endorse our isolation; we cannot afford any kind of isolation. We are surrounded by five countries. We can easily talk with them, and as they say here, walk across Rwanda village, walk across Congo village, walk across Sudan, Kenya and Tanzania and drink water by the simple words “mpa maji”—”give me water”. It is possible today for the people of Uganda to communicate with the people in the neighbouring countries in broken Swahili but it is not possible for the people of Uganda to communicate with the neighbouring countries in broken Luganda. If we cannot communicate with our neighbours in broken Luganda today, how much more difficult would it be to try and communicate in first class Luganda. I do think also that Swahili has its own problems within the context of Uganda. It is possible that one can learn a language without taking the culture that that language expresses. But the real question as I see it here is: Why should Uganda learn Swahili? or Why should Kenya adopt Swahili as a national language, or for that matter, why has the Government of Tanzania announced the policy of the adoption of Swahili as a national language? I ask this question because I am not quite convinced that having adopted an African language as a national language, a tendency would not develop to discourage all other languages around the country. If that tendency developed and became the official policy, are we satisfied that my remarks regarding the inability of Luganda to express Dingidingi songs would be satisfied by Swahili? I am not satisfied, and here we are trying to think about a possible answer to the question of why we need an African language as a national language? Do we need it merely for political purposes, for addressing public meetings, for talking in Councils? Do we need it as the language of the workers, to enable them to talk and argue their terms with their employers? Do we need an African language for intellectual purposes? Do we need such a language to cover every aspect of our lives intellectually, politically, economically? I would not attempt to answer that question but it appears to me that Uganda at least is faced with a difficult future on this matter and the future might confirm that a decision is necessary to push some language deliberately and to discourage the use of some other languages also deliberately. Swahili was taken out of schools in the past for political reasons but I think there were also strong cultural reasons. When Independence came, Radio Uganda was broadcasting in English, Luganda, Runyoro/Rutoro, Ateso and Lwo. Today we have added another ten languages on the Radio and this is a subject that interests me a great deal. Perhaps in this Seminar you will find an answer as to what is the objective in having a National Radio. I am in Government and I have to take political feelings of the people into account in formulating policies. I would not say that all our fourteen languages on the Radio are in every case necessary but I would not also go as far as to say that they are there merely because of political reasons. I think to some extent—much as we would like to have one language—there is advantage in broadcasting in these various languages as things stand today. Our policy on Radio Uganda is to inform the public and that is our first task, first objective. We want to inform the people of Uganda. We find it exceedingly difficult to inform the Karamojong in Luganda or in any other language except their own, so we have Karamojong Broadcast on the Radio. Then we use the Radio for educational purposes and we find that to assist those who never went to school at all, we must broadcast in their own mother tongues. Then there is what is called entertainment which should actually be development of culture. Since the Radio began broadcasting these various languages, there has been a new spirit in Uganda, simple composition of songs, dance teams and various competitions around the countryside. Every village is eager to surpass the other in its cultural activities with a view that one day Radio Uganda recording vans will pass around the village and record the songs and the poems of a particular group. We find this useful although we are creating a problem of how to co-ordinate these activities in future. The only aspect which I do not like on our Radio but which I cannot do anything about, is the “Pop Song”. But I understand that there are people who like pop, so that too has to stay. When it comes to news, our National Radio is in the same weak position as many national radios in Africa. I will perhaps illustrate this, by telling you that I know of a Minister in the Government of Uganda who followed the Sierra Leone trouble by tuning to the B.B.C. and to the Voice of America. He never tuned to Nairobi. He never tuned even to Kampala though he was in Kampala. When I asked him why he did so, he said he got more news about Sierra Leone on B.B.C. and the Voice of America. Certainly there was more news on the B.B.C. and the Voice of America about Sierra Leone—more than Radio Uganda could give. What news was it? And in any case what is news? Well, we struggled for Independence. We have got it. There remains a problem in this context as to whom we should listen and what we want to hear. I find it extremely difficult here in Uganda to give the people of Uganda what I consider news. I find it difficult because, first, we do not have enough trained manpower to collect what we consider news throughout Uganda everyday and to present that news to the people of Uganda. Secondly, we have tremendous difficulties in broadcasting what is news in Kenya, or what is news in Tanzania—the happenings in Kenya or the happenings in Tanzania, or the happenings in any part of Africa. What comes to us as news very often turns out to be ideas of those they call “informed observers” and if you go to investigate as to who are the “informed observers” you will find their position extremely interesting and disturbing. So we are not giving the right type of news to our people first because of our own inability to collect the news within our territory. This is because of lack of contact and lack of communication channels between one African capital and another. The O.A.U. has been talking about an African News Agency. This is the age of talking. We, find it easier to talk about Union Government and to write the Constitution of that Government, than to talk about African News Agency or to talk about how to finance it, and yet the struggle goes on as to who should control the minds and the ears of Africa. Today I have to, like all my colleagues in Africa, think in a foreign language in order to express myself to Africans on problems affecting Africans. When I move out of Kampala to talk to the people, I have to talk in English. Obviously I have no alternative but I lose a lot especially as far as the Party is concerned. The Party welcomes everybody and some of the greatest and most dedicated workers are those who do not speak English and yet the Party Leader cannot call this great dedicated worker alone and say “Thank you” in a language the man will understand. It has to be translated. There must always be a third party, and that is why it is said there are no secrets in Africa. This is our challenge. We are a young country and the vitality of youth should be able to lead us to greater days. I urge particularly the people of Uganda to turn the weaknesses of today into the strength of tomorrow.